I have three toddler grandchildren who live nearby, so I've been observing them as they learn to talk. My youngest grandchild is at the single word stage, but the older two are speaking sentences, sometimes quite complicated ones. Their speech is still full of cute language quirks, but every day they sound a little more grown-up. The union of God and man in the person Jesus stands at the very center of Christianity. Scripture tells us that the child Jesus grew and learned like all children do, so if Jesus' grandmother knew him, she probably delighted in his language development, too. I imagine her watching him progress from single words to short sentences and beyond, noting his childish mispronunciation and unconventional sentences. The toddler Jesus developed much like my grandchildren are developing, minus the ugly pinching episodes, of course, since Jesus was without sin. Jesus was fully God and fully human. That Jesus "increased in wisdom and in stature" (Luke 2:52) is evidence that he was truly human. In the incarnation, the Eternal Son, who is the second person of the Trinity, was joined forever with genuine human nature, so that Jesus was (and is) fully God and fully human in one person. If you're left wondering how that works, you're not alone. The ancient Christians took the biblical data and developed creeds outlining some things we can know about Christ's nature, but there is much they don't and can't explain. J. I. Packer calls this a "marvelous mystery"—and he's right! What did it mean for the Eternal Son to become a human being? How does his humanity benefit us? 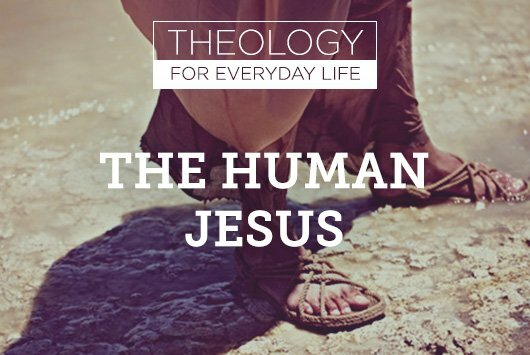 Why is the doctrine of the humanity of Jesus important? What did it mean for the Son to become human? In Philippians, Paul writes that for the Son of God, becoming human was an act of supreme humility, especially as he willingly carried out the Father's purpose by obeying "to the point of death, even death on a cross" (see Phil. 2:5–8). By becoming human, the Son, who possessed all the infinite attributes of deity, voluntarily subjected himself to natural human weakness and limitation. The Son entered our world as a baby, and what's more vulnerable than a baby depending on a mother's protection and care to survive? We see in the gospel records of Jesus' life that he grew hungry without food, thirsty without drink, and tired without rest, just like we do. He felt physical pain, and in the end, he experienced death, the ultimate physical limitation. But Jesus wasn't just deity wrapped in a physical body. Since he learned as he grew, we know he had a human mind, too. He also experienced human emotions, including sorrow, amazement, and grief. Anything essential to humanity as originally created by God was included in the human nature the Son took on in the incarnation. The more we examine the mystery of the incarnation, the more amazing it is. That the eternal Son, the Agent of creation, willingly entered into His creation by being born as a true human so that he could die is one of the truths that will keep us marvelling for eternity! Only a sinless God-man could be the one mediator bringing God and sinful people together. Human sinners required a human Savior, and there are several reasons why this is so. First, we needed an atoning sacrifice to bear our sins and die in our place. Only another human being, but one without his own sin, could do this. Second, for Christ's righteousness to be counted as our righteousness, serving as the grounds for our justification, he had to be human like we are. It was because of the human Adam's representative disobedience that we were all condemned, and it's only because of the human Jesus' representative obedience that anyone can be justified (see Rom. 5:18–19). The two sides of our justification—God's forgiveness of our sin and his declaration that we are righteous—depend on the humanity of Jesus. Only a sinless God-man could be the one mediator bringing God and sinful people together. That Jesus was human is also an advantage for the believer living as a new person in Christ. When Jesus intercedes for us with the Father, He knows from experience the kinds of pressures and temptations we face in our daily lives. He knows what our temptations feel like because He was tempted like we are. And since He never once sinned when He was tempted, He also knows the way to overcome any temptation we experience. Nothing we experience is strange to Jesus, and knowing this, says the author of Hebrews, should give us confidence to "draw near to the throne of grace, that we may receive mercy and find grace to help in time of need" (Heb. 4:15–16). What's more, because Jesus is human like we are, he can be the perfect example for us. For instance, Jesus washed his disciples' feet, giving us a pattern for our humble service to others (John 13:13–15). We can copy Christ's humble obedience by doing without things that are rightfully ours in order to serve (Phil. 2:3–8). If we are persecuted, we can remember Jesus, who "endured from sinners such hostility against himself," and draw strength from His example (Heb. 12:2–4). The goal of every Christian woman should be to become like Him, following His example of a true human life lived in obedience to God. Understanding that Christ became a true human is crucial to seeing the wonder of Christ's work and giving Him the honor He deserves. That He was willing to subject Himself to the weakness and suffering that comes with being human is amazing, isn't it? This doctrine is also fundamental to our justification (being made right before God) and our sanctification (being made holy). Jesus could live and die for us because He was one of us. And as we live daily, He can intercede for us and be an example for us because He was like us. The true humanity of Jesus is a truth so essential that John can says anyone who denies it is not from God (see 1 John 4:2–3). How does this truth encourage you today? Rebecca Stark lives up north in the Yukon, one of Canada's territories, where it's winter for eight months a year. She has four grown children and three toddler grandchildren who all live nearby. She enjoys writing about theology at Rebecca Writes and Out of the Ordinary.